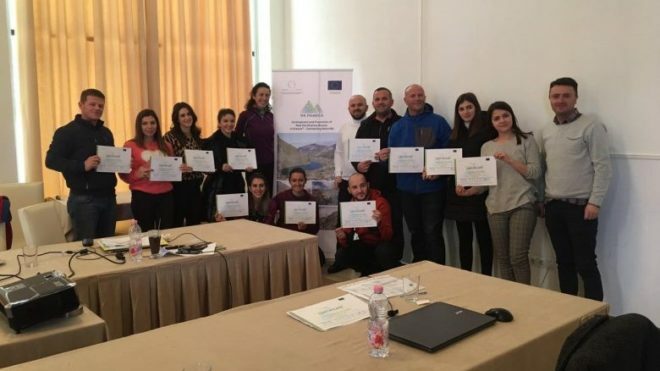 January 25-26, 2019 – CDF through its project ‘Extension of the ViP DinaricA in the CBC Region Albania- Kosovo, organized a two day training in the Municipality of Gjakova which was attended by 10 mountaineers. The topics of the trainings were the standards and legislative framework in Kosovo and the region, for mountains trails over the basis of topography, the reading modes, work documents and adjusting the trails as well as the parameters for trail setting including practical work. 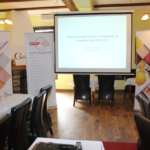 The 10 participants were from the Municipalities of Gjakove, Peje, Junik and Decan. 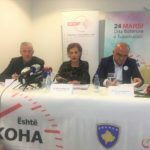 The new trail goes through the before-mentioned municipalities and aims at promoting the authentic cultures, handicrafts and tradition food, making Kosovo a country that offers tourism adventures for the international market and attracts more tourists which contribute to the development of the region. 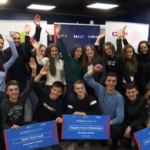 The project is funded by the Regional Cooperation Council, under the European Union’s program Promotion and Development pile, which aims to contribute to the increased competitiveness in 6 Western Balkan countries by supporting and promoting culture and adventure in the countries via a tourism package. © 1999 - 2019 Community Development Fund (CDF), All Rights Reserved.